Shop On Stage ASFSS6 GB Dual Screen Pop Filter from AMS and enjoy Fast & Free Shipping. 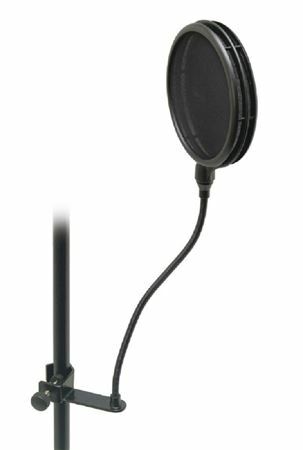 The On stage ASFSS6GB is a pro-level split screen pop filter that removes unwanted P and B consonants by providing open space between the two screens. This sophisticated design removes any air pressure that can build up in hoop style pop filters and is very effective in filtering wind-caused plosives. The 11.5 inch gooseneck is constructed from coated brass which allows for precise positioning of the Pop Blocker between you and your microphone. The first screen diffuses the air that causes plosive consonants, the open space between the screens disperses air pressure, and the second screen disperses the air and removes and remaining plosive consonants. Never got to use it before the 2nd part of the screen came loose! Now I have to find a way to restretch it & glue it back together. Not worth the money, could have made a better one myself! Great for all genre's of vocals. This product cant get any better! It catches every single pop in the T's, S's, B's, D's, P's, and more that you dont think the microphone can pick up. Clarity is still 100%, but without the popping sounds at all. Easy to use, just clip it to your stand and perform/record! The best feature of this product is the double cloth and the spacing between the double cloths. The clarity of your voice is still the same with no popping what-so-ever. Your audience might think you recorded at a famous artist studio if your Microphone compression and levels are right! High quality for a nice price.